The Big Leaf Maple Tree is the largest of all Maple Trees and one of the few species of Maple Trees that is native to the Northwest region of the United States. One interesting feature is that it has the ability to grow in a wide range of conditions; from the wet temperate rainforest zones of northern California to the warm dry climate of southern California. It tends, however, to thrive in regions where there is moist soil and plenty of shade. 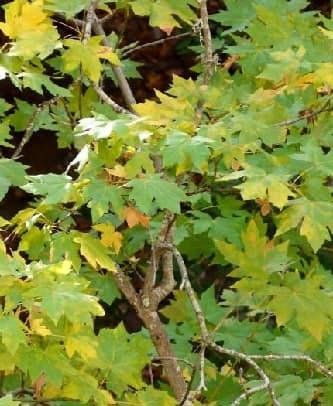 The tree is also known as the Broadleaf Maple and the Oregon Maple. The below facts provide information on what the tree looks like, why it is sometimes treated as a weed, who feeds off the tree, when the tree produces seeds, and more. This information is written for both kids and adults. Click here for a great selection of Amazon.com books about temperate rainforests. Animals are attracted to almost all parts of the tree. They feed off the flowers, buds, seeds, twigs, and foliage. Some of these animals include elk, deer, mice, chipmunks, squirrels, beavers and birds. Common places the tree is found growing include moderate to steep slopes near rivers, streams, springs, and waterfalls. Depending on how close together the trees grow, it may or may not have any lower branches. Compared to other Conifer trees, this is a relatively small tree. The trees ability to regenerate is strong, especially after being cut down to a stump. It will often compete for space with other trees, such as the Douglas-Fir Tree, and win. It is for this reason that the tree is treated and managed as a weed and not purposely regenerated. The tree will produce its first seeds, which are triangular or oval shaped, at about 10 years of age and will continue to do so each successive year of its life. Wood from the Big Leaf Maple Tree serves many purposes. It is commonly used in making piano frames. The wood is not as hard or sturdy as other types of wood but is still very good wood for decorative veneers, flooring, paneling, and certain types of furniture. As wood burning stove use continues to increase, the Big Leaf Maple is increasing in popularity as a type of fuel wood. If done under the right conditions, the sap from the tree can be tapped for a sweet maple syrup, similar to that of sugar maple. The sugar content is less than that of sugar maple, so it takes more sap to make the syrup. Big Leaf Maple Trees typically grow between 50-110 feet (15m -33.5 m) tall. The diameter of the truck is between 36-48 inches (90 cm -120 cm). As the name implies, the leaves of the Big Leaf Maple are, in fact, oversized. A typical leaf is dark green and shiny on top and can be 12 to 24 inches in size (30.5 cm - 61 cm). The tree produces scented flowers that typically appear from early in the spring until June, depending on the climate. They are greenish-yellow in color and hang down in long clusters.